Tis shareholder meeting season and Fiat Chrysler Automobiles (FCA) CEO Sergio Marchionne gave his last presentation to the group before his retirement next April. Combing over each of the company’s brands in fine detail, he outlined the goal and five-year plans of each badge including Ram. Taking center stage in Ram’s strategy over the next five years is the Rebel TRX, a model designed to take on the F-150 Raptor once it arrives some time before 2022. Though not much has been revealed at the presentation, we do know that it’ll focus on off-road performance with a dash of new technology and Ram styling. Of course the Rebel TRX will be able to perform on road as well. Perhaps the final product will be similar to the Rebel TRX concept that was introduced at the 2016 Texas State Fair. Packing a detuned Hellcat 6.2-liter supercharged V-8 power plant, it had an output of 575 horsepower. If they decide to leave the Hellcat as is without tune, we could be looking at a Rebel TRX with 707 hp and 650 lb-ft of torque. 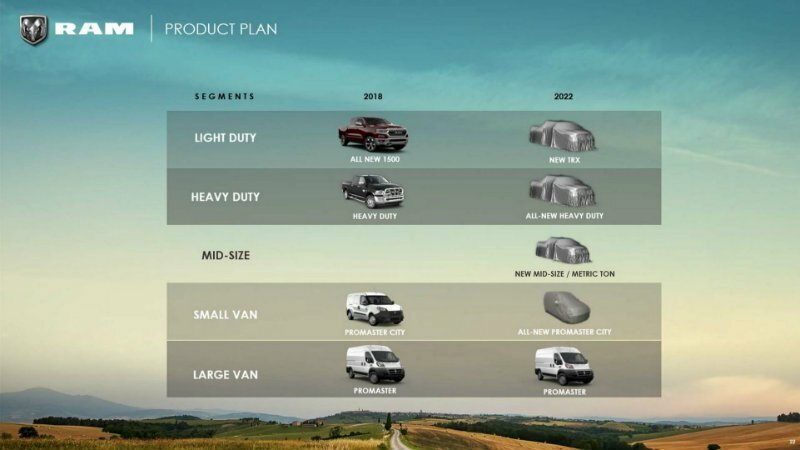 Aside from the new TRX, Ram will also be releasing a new mid-size pickup, new Heavy Duty and a new Promaster City small commercial van to replace the current model. Good luck to the TRX when it comes to market because Ford is definitely going to upgrade the Raptor by 2022. Maybe Ram will leave the Hellcat's engine as is, though I have no idea how much torque it can provide and at what rev range. I think its still going to be a bit of a challenge for Ford to match the rumored 700hp Ram has projected with the TRX. By 2022 there is a good chance that Ford will be looking at hybrid systems for all their trucks however and some electric motors could help get them there.